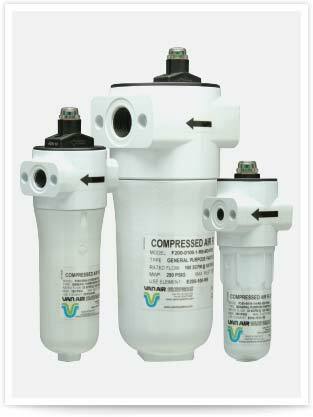 Van Air Systems F200 Series filters coalescing and particulate filters are designed to remove contaminants from compressed air and gas systems. Available in ¼” to 3″ NPT connection sizes and flow capacities from 15 to 1200 scfm at 100 psig in 15 housings and 9 filtration grades, the F200 series removes oil aerosols, oil vapors, condensed water, and particulates. F200 housings are made of cast aluminum and coated with an epoxy powder coating for corrosion resistance. All units include push-on elements with a durable polyester drain layer. Accessories include differential pressure indicators, wall mounting kits, connector kits and automatic drain valves.